Filler Liquid Scale is a machine, which fills a container with a certain amount of liquid using the weight of the liquid to fill the container to a set point. 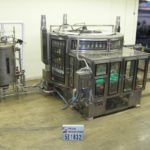 The scale liquid filler (net weight filler) weighs the container prior to fill and continuously weighs the container during the fill to reach the appropriate liquid weight for the fill. Fully automatic, 56 head, 316 S/S, rotary net weigh filler capable of up to 600 cpm. (depending on application). 82" diameter table, with 56 heads, set on 5 1/2" centers. Has a container size range of: (1" to 4" diameter) x (4 1/2" to 12" H). star wheel infeed / discharge, centering bells, no container/no fill, and centrifugal pump for overflow return, fill/clean, gross/net weigh, air valve logic controls, barrier innerlocking, lexan guarding, and all stainless steel construction mounted on a stainless steel base. Automatic S/S 4 head rotary chuck capper. Model V4/360 capable 20 of 120 cpm, depending on material and application. Equipped with a gutter drain and no container no cap with individual friction disc torque control and set on 11" centers. 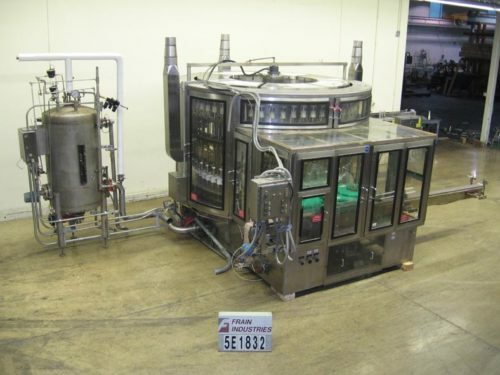 Filler OAD: (L) 72" x (W) 58" x (H) 108"
Capper OAD: (L) 52" x (W) 58" x (H) 96"
Crandall, combination, single head, pnuematic liquid filler and lid closer with number of pails per hour – depending on materials, application and operator dexterity. Fill range: 1 to 5 gallons with accuracy of 1 part in 10,000 to with in 0.1% of target weight. for filling of non-foaming and semi liquid products which have no particles. Containers: Plastic, metal, glass and composite with proper change parts. Equipped with 132" long x 14-1/2" wide roller conveyor with 1"OD rollers on 1-1/2" centers and 1/2" gaps. Filling head and 14"OD lid ram compression arm with pressure guage and both are hand crank height adjustable. Control panel touch pad with read out and main power, manual off auto, jog, glycol on / off switches with empty and full pail, lid drop with e-stop and numatic package. Mounted on heavy duty painted base frame. 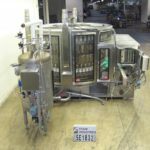 Velcon, Model CD4T55, net weight, palletized 55 gallon drum and tote open top non-foaming liquid filler with number of containers per hour – depending on materials, application and operator dexterity. 316 stainless steel wetted parts. Fill range: up to 55 gallon drums or 72" totes of non-foaming liquids. 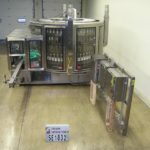 Equipped with 2" OD net weight, cut off filling lance, no drum / no fill and net weight over / under fill monitoring features, with 48" x 48" 5,000 lb capacity weigh scale base with DWM-IV microprocessor weigh meter control system. 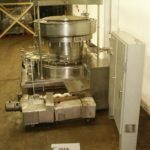 Crandall Model EF14X220FE, electronic, sub surface, net weight, 55 gallon drum / tote filling system with number of containers per hour – depending on materials, application and operator dexterity. 316 stainless steel wetted parts. Fill range: 55 gallons metal or plastic containers with fill openings as small as 1-3/8 with proper change parts. (Currently has 2-1/4" OD x 42" stainless steel lance). Equipped with two stage, diving, cut off lance, NEMA 1 enclosure and scale indicator with NEMA4X stainless steel enclosure. Scale section 60" long x 50" wide with 5,000 lb capacity. One 5′ section of in feed and one 5" section of discharge conveyor. Change parts required to accommodate size range. Crandall Model FD122PLX, sub surface drum filler. with number of drums per hour – depending on materials, application and operator dexterity. Equipped with 28" x 27" scale roller platform, with capacities up to 1000 lbs, 2" OD x 36" long single stainless steel filling lance, with tare button and hand crank tare wheel over-under indicator. Operation: operator presses the tare button and turns the tare wheel until the over-under indicator shows balance then presses start button and the lance descends to the bottom of the container begins to fill, lance rises slowly to the safety stop, container approaches shut-off weight, flow rate reduces to maintain accuracy. when shut-off weight is reached, the lance withdraws from the container and operator removes and replaces. Speeds dependant on materials, application, machine configuration and operator dexterity. 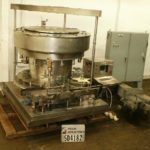 S/S, 15-head rotary scale filler rated up to 150/min (last running 5 gallon viscous fills @ 28/min). Equipped with AB PLC, no-container no-fill and drip tray. Maximum container size: round: 11", Max scale weight capacity is 66 lbs. Capable of filling a variety of products from light to heavy viscosity at hot or cold temps for both abrasive and non abrasive products. OAD: (L) 120" x (W) 84" x (H) 108"